I had intended for us to do regular bush walks this year, as part of getting fitter and burning off some flab. We did one, at the You Yangs, in January. We did the walk up to Flinders Peak to admire the view and get the heart pumping. Turns out the park was damaged during floods in February, and it’s all closed at the moment. Must try and do some more bushwalking at other nearby parks… perhaps one every month or so would be good. Locally you could walk the trails around yarra bend park.if you started at Fairfield boathouse there are lots of good trails, finishing up at the boathouse for coffee & cake! I’ve actually never eaten there but it’s always busy so must be alright! I agree with Jen: the purpose of a bushwalk is to finish it with coffee and cake. 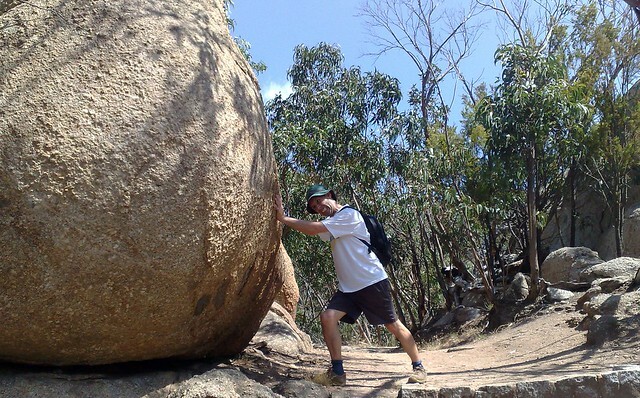 I got a nice workout one day climbing Hanging Rock. This park was much more interesting and beautiful than I thought it would be before visiting. Strangely, both the train from Fairfield and the one from Nunawading continued on to Glen Waverly, so I didn’t even have to change trains at Flinders Street. Just lucky, I guess. I did these walks in three successive Januarys. Allow a good 4 hours for each walk. You will know you’ve had some exercise when you finish any of the above. The Dairy Bell shop is conveniently located a few hundred meters from East Malvern Railway Station for those who want to indulge in milkshakes or sundaes. A shorter walk that I can recommend combines parts of the first two walks with a chain of parks across Glen Iris to make a triangle about 8km long. But bushwalking is nicer in the bush rather than the suburbs. Can I nominate the area around Sherbrooke Falls, usually starting from the picnic ground (Melways 75G2) and continuing past the falls along the Ridge Track – we rarely fail to see or hear a Lyrebird. (Caveat – haven’t done this walk for about 3 years).